CATALINA ISLAND — With the success of Catalina’s zip line and eco tour to build on, the Santa Catalina Island Co. is looking at other adventure projects that will bring more visitors to the island. The latest project, called the Descanso Canyon Swing Adventure, would have riders climbing out along a 600-foot-long cable bridge that extends halfway across Descanso Canyon, where a giant swing ride awaits. The plan, still in its design phase, received the approval of the city of Avalon’s Planning Commission at its Dec. 6 meeting, and has created a Mitigated Negative Declaration that was approved by both the Department of Fish and Game and the Native American Commission. “We’re really excited about this Canyon Swing project, and I think it’s consistent with the direction we started going in when we built the zip line,” said Santa Catalina Island Co. vice president of planning Kris Wilhelm. 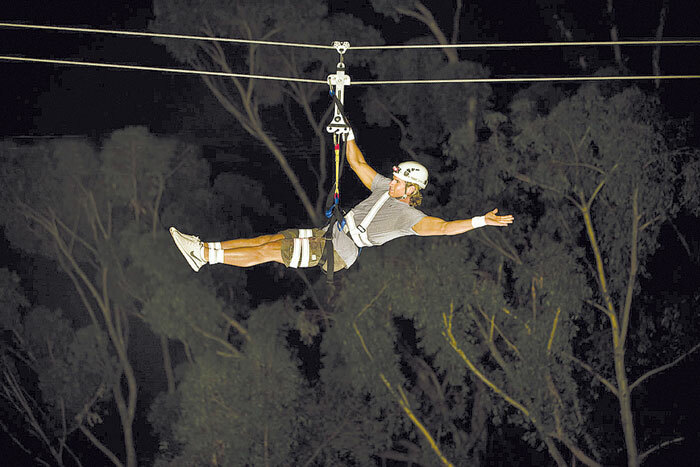 According to the report, the Descanso Canyon Swing Adventure will be based out of the existing zip line base camp at Descanso Beach, where riders will be fitted with the harnesses and gear, and briefed on safety tips. After the orientation and education portion, a shuttle van will transport the riders up along Hogsback Road to the platform turnout. From there, riders will walk up a flight of stairs onto a 3.5-foot-wide platform extending 600 feet out over the canyon, reaching a 150-foot height. From there, they can choose between three different activities: swing, bungee jump or freefall. In addition to the adventure portion, riders will get an orientation on the local plant flora and fauna, as part of the Santa Catalina Island Co.’s ongoing efforts to promote island conservation while developing new projects. Catalina Island Chamber of Commerce president Wayne Griffin said the swing adventure would be a welcome addition to the island, giving visitors another reason to cross the channel. If no appeals are made to the Planning Commission’s approval, the Santa Catalina Island Co. can then send the construction drawings to the city for a plan check. Wilhelm said the project is hoped to be open and ready for the 2013 summer season.